Oh how I loved this post by La Vie Graphite: re-ground. I guess I felt a kinship because I have recently discovered the joys of retreat, although not to the extent outlined in this post. 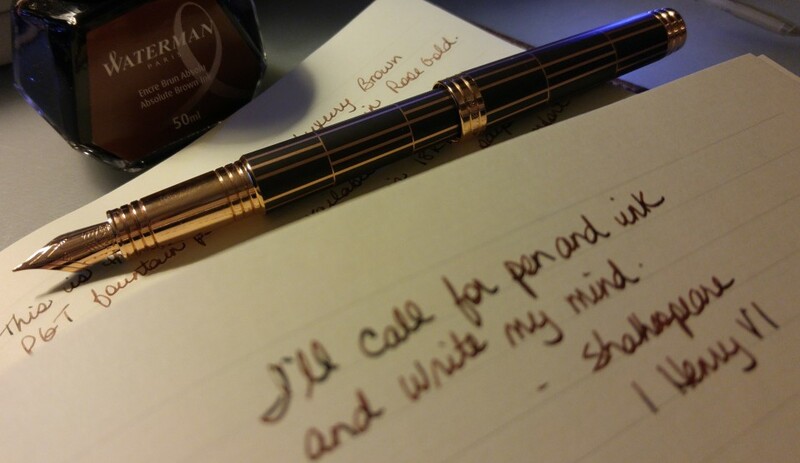 I especially loved the final photo of fountain pen at rest in the journal. Well worth reading. This post on Tiger Pens Blog got me thinking. When I was in university no one had a laptop with them, actually most people didn’t even have them in their rooms. (Yes, I’m old.) We had to go to the computer lab to type up notes or print papers etc. So I can imagine how distracting it would be to have 80 people typing during a lecture. And of course I’m a big believer in the connection between handwriting and the brain and actually learning better through writing. But…in my professional capacity I can type much faster than I can write so if I have to take notes or minutes at work I will take my laptop with me. So I can see the appeal of a laptop in a classroom setting. What do you think? Interesting debate. And finally, jumping off the Tiger Pens Blog, I found 6 Ways To Combine Chaos and Order in One Notebook from kickingassandtakingnotes.com (great name!). JD shows how to manage all of the information traditionally dumped into your notebook, from to do lists to emotional rantings. I like the ideas and use some of them myself. This is why I have more than one notebook on the go at one time. I will definitely be adding this blog to my blogroll. I, too, type faster than I write. However, as someone who teaches face to fact classes in a university setting, I can pretty much validate that students are not taking notes on laptops. Students often think they can hide this, but it’s in the faces of the people around them (the people around them can see the screen, too, and when they start snickering or reading intently over the person’s shoulder, it’s not because the student’s notes are so good). Nonetheless, I allow laptops in the classroom because I usually teach from digital texts and I refer to online sources and presentations. I do find that students with laptops are not as engaged in the class discussion, and I discuss that, but I’m not going to police adults. I do give a participation grade, and if students are substituting participating with the members of the class with participating with Facebook, that’s their problem. It will affect their rather hefty (20%) participation grade. Oh, I forgot to mention that it is not just the grades of the students who used the laptops that suffered in the Mueller and Oppenheimer study (Scientific American), but also the grades of students around them (likely because of the distractions offered by the laptop users). It’s an interesting study to consider, and it might explain what seems like a draconian action by an administration. You have to remember that these days, funding often relies on graduation rates, and institutions are doing all they can, often based on science, to get students through. If graduation rates are dropping, technology may not be helping people get through, but actually hindering them in their efforts to graduate. Excellent points Denise, I hadn’t thought of the grades angle. Smart of you to include a participation element in the student’s overall grade. And thank you for sharing the Scientific American article. You are correct, your role is not to police adults. I can totally see why certain institutions would ban laptops. Long live pen and paper!